the TELUS science center, a fully kitted-out museum with an IMAX screen and planetarium. The Old Strathcona district is south of the river and blends historic buildings with lots of eclectic restaurants and simple museums. 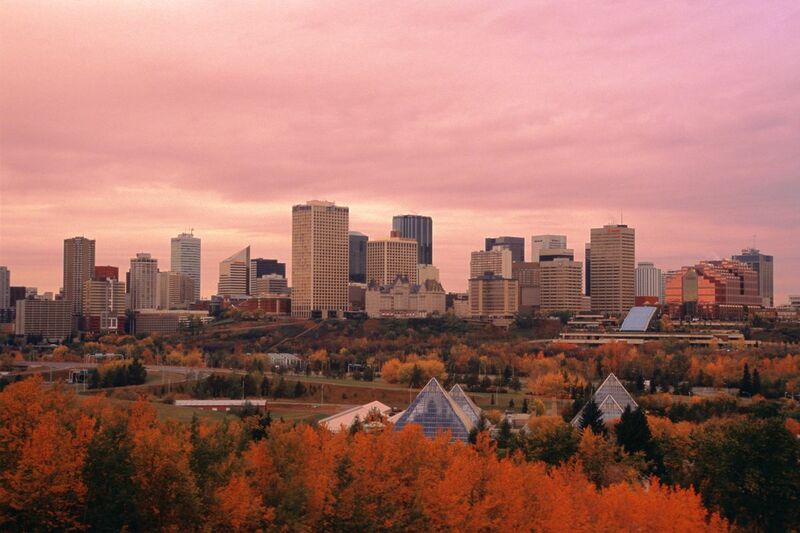 Edmonton is the capital of the Province of Alberta, and the city itself has a population of over three quarters of a million people, actually more than the population of San Francisco. The greater metropolitan area is over 1.1 million. This is a corporate staging point for a lot of activity farther north, where tar sands and shale oil are being reclaimed for an energy hungry continent. Consequently the petro-chemical industries are strong local employers. It is the fifth largest city in Canada, and although is is farther north than its sisters in Saskatchewan, Regina and Winnipeg, the climate is actually drier and warmer. The city loves their Oilers hockey team, and their CFL football team, the Eskimos, have won the grey cup in the past. Great city! It might be smaller than some cities but it has more heart than most. It has a beautiful river valley, great restaurants, and wonderful neighbourhoods. Edmonton has a world class feel while retaining quaint small town neighbourhoods. It has some awesome restaurants and the number and variety of food trucks is always growing. The art scene is great with lots of great local theatre to see. There is always a festival of some sort happening in Edmonton so there is never a lack of things to do. To visit or live, Edmonton is great. Lived in this City for almost seven years from 1974 until 1981, with forays to Calgary, San Francisco and Winnipeg, Manitoba thrown in, and say that I'm wondering how my old haunts in Edminten ( this is the way that the English speaking population pronounce it and is, quite obviously, a corruption of the way that it is supposed to be pronounced! ) but we used it affectionately and I still have two sisters and their humongous families living there so I can, always, guarantee a cheap holiday to Western Canada if I wanted to! Having lived there as a landed immigrant I was legally entitled to live and work there ( which makes a very pleasant change, Ha Ha! ). I could return there tomorrow if I wanted to or, more importantly, could afford to! As it is the Oil Capital of Canada and, also, the Provincial Capital of Alberta they have both an impressive, modern and vibrant City Centre, but it is quite isolated geographically and the weather is far too cold for me during the Winter time! Too much snow and black ice for my satisfaction and comfort, although the rest of the year is not too bad with them having definite seasons Their Spring is absolutely beautiful and fresh and warm, the Summertime there is hot and dusty, with absolutely incredible thunderstorms that I have NEVER seen the likes of since returning to England - I am terrified of lightening and, therefore, used to avoid going out when they started! That, of course, leaves the Autumn ( or Fall as the locals call it - another bad influence of their southern neighbours, the US of A ) which is rainy and cold at night but with the appearance of the Aurora Borealis it was possible to experience the beauty of that phenomena on a very regular basis! After living there for so long I reckon that I know how Edmontonians are as a people and they are, quite justifiably, proud of their City. They, also, have the benefits of Klondike Days during July each year, which is a celebration of the discovery of gold in the Yukon and returning to establish the City of Edmonton! The people of Edmonton are a mixed bunch really because of the fact that there are a lot of French Canadians , Ukrainians and, of course, people with their roots in the UK and Ireland. The diversity of the population is so great that it would take me forever to describe what it's like to actually live there! The only times to visit, in my estimation and based on my own personal preferences are the Winter time ( too flippin' cold! ) and the Summertime for the reason mentioned above as well as the amount of mosquitoes that are around in the countryside and at the Lakes! I would, however, recommend it as a great place for young families and the more active and adventurous because of the amount of activities that can be done all year round! The countryside is so vast and beautiful that I imagine that the real adventurers amongst you would love to spend a month or so travelling around the whole Province. Best cup of fall (almost) coffee. LEVA cafe & ACE coffee roasters #1 bean.